1. Gather your material. You will need a picture of the child, gold cardboard, the top of a metal can, a pencil or pen, white glue, a hole punch (not shown), a fastener, scissors, and Christmas ribbon. 2. 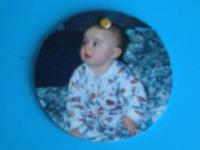 Trace the top of the metal can on the picture, centering the child's face in the circle as much as possible. 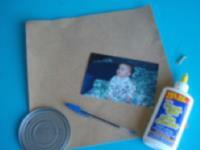 Cut out the circle and glue it on the metal lid. 3. Using a drill (or a nail and hammer), make a small hole at the top of the circle, big enough to insert the fastener. 4. 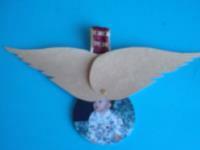 Trace two angel wing shapes on the gold cardboard. 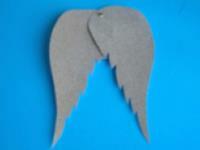 Cut them out and use the hole punch to make a hole at the top of each wing. 5. 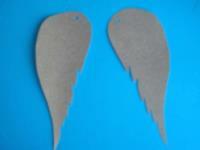 Deposit the wings on the picture and secure them with the fastener. 6. 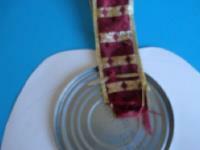 Make a hole in the ribbon and use the fastener to attach it behind the metal lid. 7. 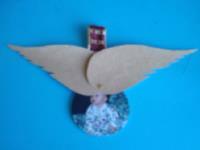 You will be able to open and close the angel wings to reveal the child's picture.